As a tribute to a very great man, here is a blog post from my colleague Judith Twani. For more information about Judith’s work click here. The world is mourning the loss of one of the greatest statesmen of our time, a man that is forever imprinted in the history of the world. Some are calling him a “black Jesus”, a saint and a saviour, titles he would have been very uncomfortable with as he recognised his own weakness and human frailty and the contribution that all his comrades made to the liberation of the nation. The grief for us as a family is as if we have lost a family member. He has, for me personally, always been there in the background of my life. He was put on trial the year I was born and he was released from prison the month after I arrived in South Africa to start work as a teacher. For my husband, however, he was at the foreground in the struggle against an unjust and brutal regime. My husband shared the pain of imprisonment and torture, of living in a country where the colour of your skin determined everything. 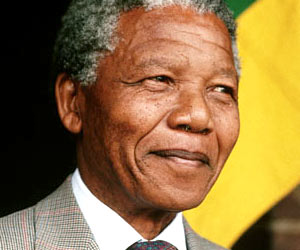 He had met Mandela and was privileged to be able to pray with him. So the night we heard of his death was a night of tears and grief. But what impacted us deeply was the reaction of our 20 year old daughter. She sobbed and said it felt like she had lost a grandfather and went on to say that without Mandela she may not even exist. Her father may have been killed in the struggle and never have met me. And she talked about how she remembered Mandela touching her hand when she was only 4 and we were at some event in Cape Town, where she was born. When she was in Year 6 she chose to make Nelson Mandela the focus for her project and won a prize for it. And it made me reflect on how early experiences have such a great impact on young children. Our daughter has lived in the UK for most of her life and yet running through her veins is her connection with South Africa. Her sense of identity was being shaped and sculpted from her earliest days and now as an adult she is able to stand tall as an African and an English woman. Let us not forget that these young children are like wet cement, as Wess Stafford describes them. There are impressions that we leave in their lives that will be there forever. We have such a responsibility to tread carefully. Digressing slightly, we held an 18th birthday party for my son in October. A tall, well dressed young man approached me with the words, “Mrs. Twani, it’s great to see you. Do you remember me?” Of course I remembered the member of the tricky year 2 class I had taught about 12 years previously. After exchanging some memories he announced that I had been the best teacher he had ever had. I asked him what I had done to earn this honour, knowing that it probably wouldn’t be anything to do with his SATS! His answer touched me deeply. “One afternoon I fell asleep in class and you picked me up and carried me to the library. You made me a bed of cushions and bean bags and laid me down to continue to sleep. And you put some comics round me for me to read so I would be happy when I woke up.” My act of kindness had left an impression that will be forever in this young man’s life. But back to where I began… as I mourn the passing of one of the greatest sons of Africa and the father of the nation, I am revisiting my collection of movies set in South Africa. As I write I am watching the film “In my Country” about the Truth and Reconciliation Commission in South Africa. One scene stands out particularly. A white policeman sits in the dock opposite a young boy who hasn’t spoken since the day he watched the policeman kill his father and mother. The policeman describes how he couldn’t manage to shoot the child and how he has been tortured in his sleep ever since. He begs for forgiveness as he kneels at the feet of the boy who just stares at him . The boy stands emotionless and steps towards the kneeling man and what he does demonstrates the deepest, most profound response to extreme injustice, he opens his arms and embraces the man who caused such pain. To read Judith Twani’s other posts visit click here. I have the impression that schoolchildren will be studying the life and achievements of Nelson Mandela for centuries to come. It seems to me that people are crying out for political leaders with his integrity. They must exist, and we should start voting for them! Very best wishes, and all the best for Christmas, new year and for an exciting 2014. I have posts lined up featuring Jethro Tull, Flight of the Conchords, Modern Family and assorted 70s bands like Focus (the Dutch bands with the yodelling elvin folk speaking in tongues) and The Doors.